So whatever is released on Wednesday, we can be sure it is going to be a significant announcement. Add to this the findings by an analytics firm of an unknown hardware device that runs the as yet-unreleased iPhone OS 3.2 and it seems likely that the new product is a mobile device of some sort. The analytics firm reports that they believe the new device is a tablet, citing in part that the applications being tested on the device are falling in line with what is expected the rumored tablet to feature, showing a strong tendency towards news, books, and media consumption. I would suggest that if you are considering a purchase of a laptop, netbook, or some sort of mobile device, wait at least until the dust settles at the end of this week. I’ll certainly be posting more after I’ve had time to analyze whatever is announced on Wednesday. It Might be a Paintball Gun? 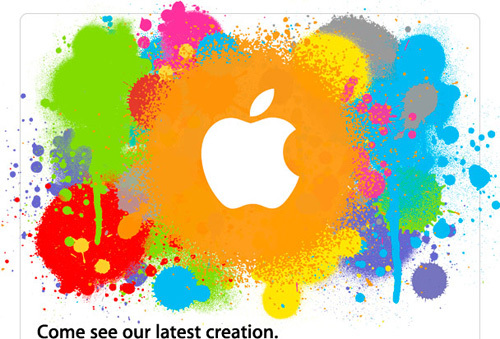 Apple has officially confirmed a January 27th event, 10 AM Pacific time. They have sent out invitations with a paint splattered theme, sparking speculation over exactly what that could mean. The invitation, pictured below, doesn’t exactly say “tablet computer” to me. But if Apple is releasing a tablet computer, maybe there’s going to be some sort of “finger painting” app that shows off pressure-sensitivity features or something. Or maybe they just wanted a visual representation of the “creative process”. Like I said before, tablet or not, all evidence points towards something really big, so pay attention on the 27th. January 27th … Don't Miss It! June 6th, 2009 was the 65th anniversary of D-Day, the allied invasion of German-controlled France during World War II. It was also the day that the highly anticipated Palm Pre smartphone was released on Sprint’s network. Many people are noting the potential symbolism of this date for both Palm and Sprint. The analogy is that the iPhone has so quickly and thoroughly dominated the smartphone market, it has been like the German Blitzkrieg of Europe. Palm, the originator and former leader of the PDA/smartphone market, has been pushed to the brink of irrelevance by its competition. Sprint, a once powerful player in the wireless industry, has fallen upon tough times lately, hemorrhaging customers over the last few years. The fact that the iPhone is only available on AT&T’s network has certainly contributed to Sprint’s troubles. The Pre will either be these companies’ last desperate gasp, or the bold attack that will lead them back into contention. June 6th may have been a D-Day for both Palm and Sprint, but unlike the Allied attack, the outcome of this battle is far from certain. There are many detailed reviews and articles analyzing the significance of the Pre, as a quick Internet search will show. And the hype surrounding the device is causing a lot of polarization. Many are pitting the Pre against the iPhone in an all-or-nothing struggle, as if there can be only one smartphone in the market. Of course, this is silly, as there is yet plenty of room for competitors. However, perception can be reality and if the Pre does not make a big splash, the media attention the iPhone juggernaut generates could very well drown out the Pre. My take is that the Pre is quite advanced and feature-wise can compete with the iPhone. However, as has been proven over and over again in the technology industry, it takes a lot more than good technology to make a product successful (a lesson that Apple learned the hard way and is sure to never forget). The unfortunate fact is that Palm has a lot riding on this device (and Sprint to a lesser degree). In a different time and place, one where Palm was a stronger company and where there was no such thing as an iPhone, the Pre could possibly be extremely successful, or at least appear to be much more successful with no iPhone to compare it to. However, this is 2009 and the iPhone has a 2 year head-start in this “new world” of smartphone market, one which Apple basically created. With the speed that technology has been advancing lately, 2 years is a long time for a product to have gained momentum, and few products in the history of tech have had the type of success that the iPhone has had. Add to that the strength of the Apple App Store and it will take an extraordinary level of success for the Pre to dislodge any significant share of the market from the iPhone. An interesting subplot to all this is the timing of the release date of the Pre. Palm has decided to release the Pre two days before the keynote speech at Apple’s World Wide Developers Conference, where is it widely anticipated that Apple will be introducing a new iPhone device, as well as the 3.0 version of the iPhone software. At first glance, it seems unwise to release a new product only 2 days before your competition dominates the media. But some have theorized that this was actually a smart move on Palm’s part, as it allows the Pre to ride the coattails of the iPhone publicity. In effect, Palm will be co-opting Apple’s media exposure, as there will be much made of the comparison between the two devices. A different release date may have not garnered the same amount of media attention. In a kind of preemptive attack, Palm’s gamble may give the Pre the best chance of success.